Hello everyone....I have a problem with my laptop...I just bought it few weeks ago and it can't detect my r5 graphic card. I downloaded all drivers from lenovo official site but..it still won't work...I'm running windows 7 64 bit. Also I did check the bios setings and it's set as switchable graphic...Can anyone help me with that? Can you please send me a PM regarding the B50-45's Serial Number (eg., CB12345678) to check the specs of your system. 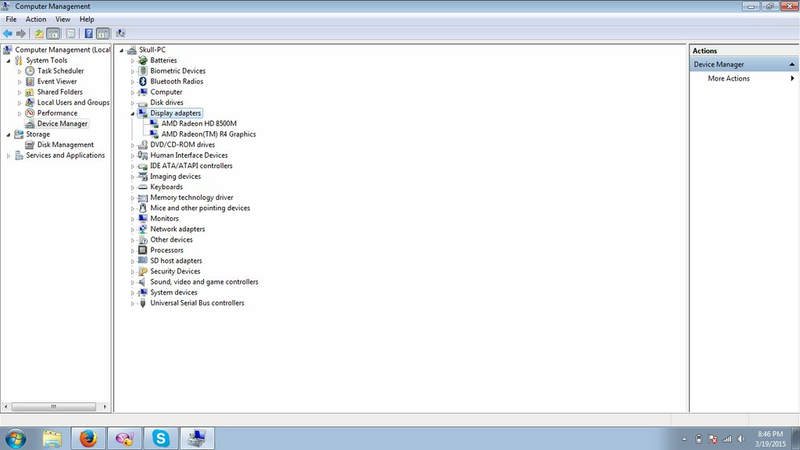 The AMD Radeon(TM) R4 Graphics that you see in the Device Manager > Display Adapters is from the A6-6310 which is an integrated graphics. 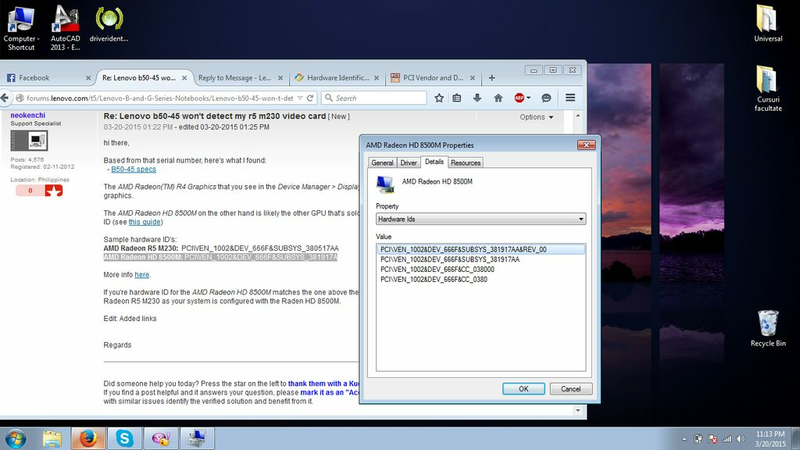 If you're hardware ID for the AMD Radeon HD 8500M matches the one above then this may explain why Windows doesn't show the AMD Radeon R5 M230 as your system is configured with the Raden HD 8500M. After you told me that ""The AMD Radeon HD 8500M on the other hand is likely the other GPU that's soldered on the motherboard. You can verify this by the hardware ID (see this guide)"" I did what the that person said in the guide and here's what I found. I took the hardware ID from my AMD Radeon HD 8500M and I wrote at "Vendor search" 1002 and at "Device Search" 666F as you can see in this picture --> http://i.imgur.com/DwN1nkih.png. This means that your model did came with the AMD Radeon 8500M and not with the Radeon R5 M230 but the two GPU's are identical (check this review). I did what the that person said in the guide and here's what I found. I took the hardware ID from my AMD Radeon HD 8500M and I wrote at "Vendor search" 1002 and at "Device Search" 666F as you can see in this picture --> http://i.imgur.com/DwN1nkih.png. 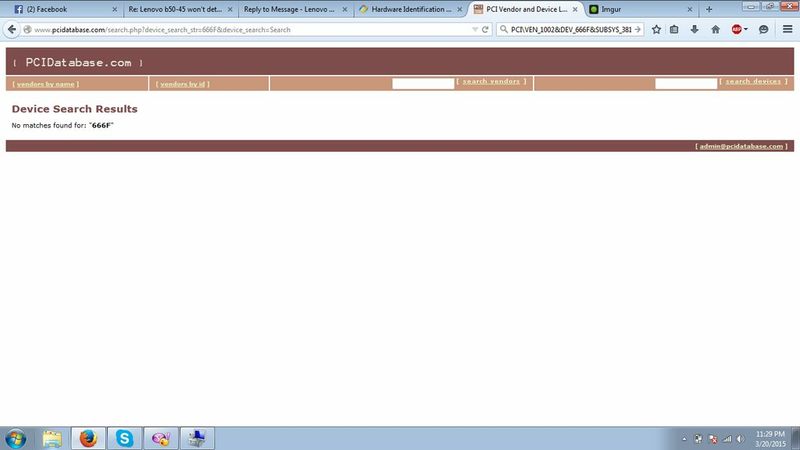 This means that the pcidatabase.com website is not yet updated with the AMD Radeon 8500M's hardware ID. So what can I do in this case? I need to go to the store and replace my laptop or something like that right? If you specifically ordered a B50-45 with an AMD Radeon R5 M230 then yes, you will need to contact the place of purchase (if it's still possible to get a replacement unit) as you definitely received a different model.